Driving to and from work, school, or the store can be a drag waiting for all that traffic. Not to mention the simple fact that most cars produce pollution and cause serious environmental issues over time. Even the smallest drive produces pollution. Luckily, there’s a solution to both of those problems. The Swagtron Swagger High-Speed Adult Electric Scooter is a unique way to get around town in style. You also don’t have to worry about polluting the environment since this electric scooter uses zero gas, thus emitting zero pollution! In a time where so many people seem to forget about our environment, it’s so nice to see new technology pay respect to the current issues. Scooters used to be a kids-only means of transportation. They were only used for small tricks and occasionally going up the street or small distances. There’s always new and improved technology, so when scooters suddenly became electric, people were going crazy. The problem was that they were still initially for kids only, and they were too small for an adult. It’s very rare to have one of these unique inventions created to work for adults as well, but finally, someone got the right idea and made it happen! The Swagtron adult scooter quickly became well sought after and people from all over started buying them. They’re a much more practical way to avoid traffic around town and prevent pollution. Not to mention the fact that they’re incredibly fun to ride around on! For many years, gas-powered vehicles were the only option for anyone looking for actual performance. Electrically powered vehicles just didn’t have the wattage and efficiency to pull the same level of weight and charge time to really compete at all. However, recent advancements in technology have changed the game completely. 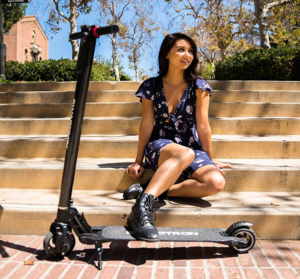 Just like its other brother the Swagtron Cali Drift, this packs a 250-watt motor that goes up to 15 mph for 15 miles, which comes out to a max of one hour per charge. Although that’s not incredibly long, it’s still more than enough to get around town or go to someone’s house. It’s also a great way to get outside and enjoy the world rather than staying trapped in a car! Another awesome feature for this electric scooter is the battery life system. This system allows you to check and adjust the battery life and charge time for your scooter without having to plug it in and wait. Many competitors don’t give much insight into how battery life works on these scooters, but they didn’t give any logistics as this one does. The carbon fiber body frame of this electric scooter is incredibly durable. Each unit is required to pass multiple tests and procedures in order to be qualified to be sold. Carbon fiber is widely known as one of the strongest materials around, especially in vehicle mass production. Don’t settle for the cheaper alternatives, as they just rust and break down in a year after a single rainy season. With performance and durability found on the Razor AX200, this thing is the best bang for the buck you can get. Carbon fiber is strong enough to withstand 250 pounds on this build, which is more than enough to bring you around town and back without worrying about causing damage. When you’re ready to finish up riding, the scooter folds up small enough to pack away without a problem. Not only is it sturdy, but it also has a high-end sleek design comparable to the KKA portable scooter. There are also shocks that are incredibly useful for making a much smoother ride. 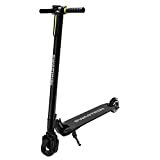 Instead of every single bump in the sidewalk sending an uncomfortable surge through your feet and legs, the shocks on this scooter absorb it all. Not to mention that they absorb the impact of driving of the sidewalk or accidental drops. When it comes to battery-powered scooters and smaller vehicles, there are usually two options: Lead acid and lithium ion. Lead acid was the more popular choices for a while because it was much cheaper. Featured on many electric scooters such as GOTRAX GXL, lithium-ion is becoming more and more common, and they’re obviously becoming cheaper. So what’s the difference between lithium ion and lead acid? Lead acid weighs much more, lasts half as long, requires regular maintenance where lithium-ion doesn’t, and lead-acid is made with cheaper materials. The only benefit that lead-acid has over lithium ion is that since it’s made cheaper, it is cheaper in cost. However, when it comes to the old saying ‘you get what you pay for’, it couldn’t be more true with batteries. After just a couple years a lead acid battery could die, whereas the lithium-ion lasts 5+ years. If you’re investing your hard-earned money, you probably want more use out of it, right? + Carbon fiber body frame for a long-lasting, hardened and durable ride. Most metals rust quickly, but carbon fiber continues to last much longer in harsh elements and won’t break or crack. + Lithium-ion batteries are much longer lasting, much lighter in weight, and much more trusted than lead-acid batteries. They also provide a longer overall lifespan, which makes it a no-brainer to choose. + Holds up to 250 pounds of weight, which is more than enough for most users. Travel around the town without breaking a sweat. Not to mention that you can enjoy the sights and sounds of the city without being stuck in the car! + Electric powered scooters don’t put off pollution like gas powered vehicles do. While riding in style, you can also help preserve the environment! It’s an excellent choice to make a dent in an ever-growing problem. + This electric scooter only lasts for an hour of use at maximum speed. This might be a downside for some users, but it charges quick enough to use multiple times a day. 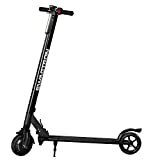 + Since this scooter uses a lithium-ion battery, it costs a little bit more than some competitors. That being said, it also lasts 2-3 times longer and it’s lighter in weight. This scooter is suitable for all sorts of people. It’s great for anyone looking to ride around town while avoiding traffic and cruising down the streets. Instead of slowing yourself down behind all the other people in cars on the road, this sleek scooter can get you to your destination by riding the sidewalks and skipping all the car pile ups. This is also a great electric scooter for kids to go round the neighborhood. Anyone looking for an environmentally-friendly alternative form of transportation would also enjoy one of these. Not many people care enough about the environment to alter their form of transportation, but for those of you who do, then this scooter is an excellent choice! While has pollution by millions of drivers is impacting the world negatively every day, it’s important that some of us find a better way to get around the city without worsening the issue. Finally, this electric scooter is useful for anyone just looking to have a good time. There doesn’t always have to be an underlying reason to get a cool new invention. This scooter is like a toy for adults! Instead of watching all these cool new items coming out wishing that they were around when you were a kid, you can enjoy one for yourself. It’s about time that these companies look after the people who are buying them! When we first caught sight of this electric scooter, we knew it was a big find. Getting from place to place on one of these things isn’t just easy, but it’s incredibly fun! They’re not the most common vehicle around, so you’re sure to turn some heads on these scooters. When you’re done, they fold right up and can be stored easily. Also, although we’ve mentioned it a few times, remaining environmentally conscious is very important. It’s unreasonable to assume anyone in their right mind would take a road trip on one of these, and since they’re not freeway-legal, you can’t even attempt it. However, small trips around town on one of these scooters isn’t a bad idea at all. In fact, it’s a great way to make a positive impact on the world. The two key factors that made this scooter stand out from the rest of the electric scooters was 1) the lithium-ion battery which is far for efficient in every way than lead-acid batteries, and 2) the carbon fiber body. The body of most other electric scooters is usually where other brands will cut corners, which results in a cheaper scooter up front but a dissatisfied customer in a year when it rusts out. The build and battery of an electric scooter are both the most important parts when it comes to buying a new one. 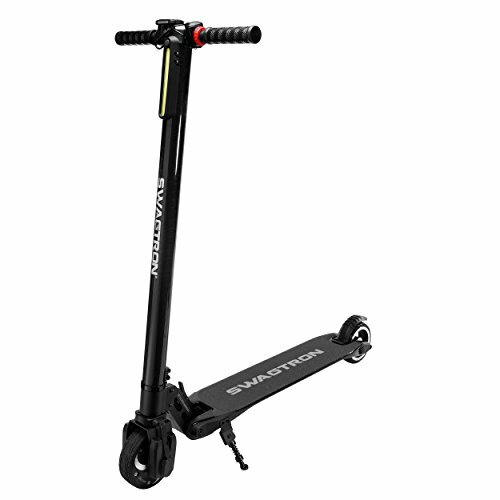 For only a little bit more, you can get a great long-lasting and durable electric scooter like the Swagtron Swagger Adult Electric Scooter. Not to mention that Swagtron is one of the most well-known brands in electric scooters, hoverboards, and trikes on the market. 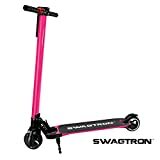 Instead of settling for some knock-off product, we loved the quality and longevity of the Swagtron Adult Scooter so we wanted to recommend this as soon as we could!